Preheat oven to 275 degree F. In a large mixing bowl, cream butter at medium speed. Gradually add sugar while continuing to cream until light and fluffy. Add whole eggs and yolks one at a time, beating well after each addition. In a separate container, combine the dry ingredients(flour, baking powder, nutmeg, cinnamon, mace and allspice). Alternately add flour mixture and the vanilla, rum, and brandy into the creamed butter. Add raisins, glazed fruits, and assorted nuts. Mix on low speed until all ingredients are combined, around 3 minutes. Dredge these first in a little flour to keep them from sinking in the batter during baking. Grease tow 8 x 3 ½ loaf pans. Line bottoms and all sides of loaf pans with waxed paper or brown paper. Grease again and line with another layer of paper. Soon mixture into the loaf pans. Decorat etop with candied cherries and whloe nuts. Place loaf pans in bigger pan. Pour water around the loaf pans to make a water bath (bain marie). Bake in preheated oven for about 1 hour and 30 minutes. Cool fruitcakes completely in pans. Remove from the pans and peel off waxed paper. 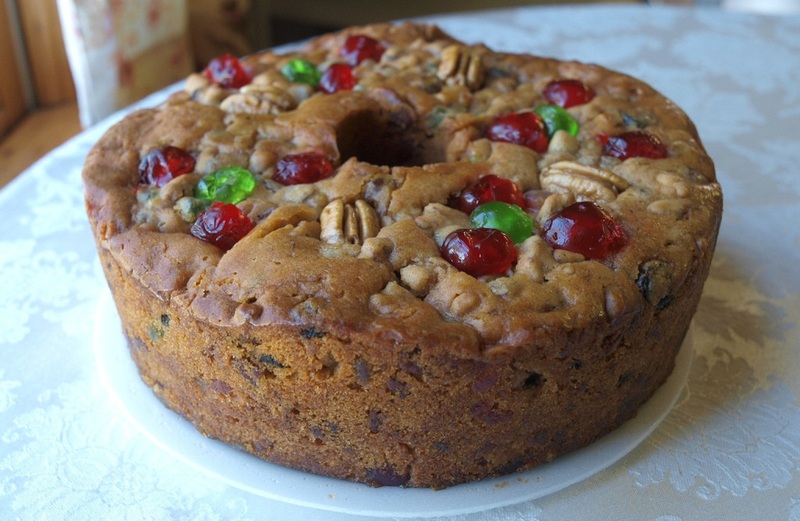 Brush fruitcakes with brandy for added moisture and flavor. Wrap each loaf in aluminum foil. Store in refrigerator or freezer until ready to serve of for gift giving. End.